I'm back into full blogging action again this week, starting with a Christmas Gift guide. It's definitely my most favourite one, as I designed this with Noah in mind, incorporating a few bits we have got him for Christmas and also because he really, truly understands Christmas this year I wanted to make sure we go all out. I hope this can provide some inspiration if you're struggling for ideas, or even spark an idea that your little one might just love something here too. Buckaroo - An absolute staple in every single childhood, surely it's one of the oldest board games around? Well we actually spotted this a couple of weeks ago and Noah has absolutely adored playing it as it gives him that little fright when it bucks off, something he gets a huge kick out of. Although be warned, toddlers like to cheat! B toys drum - I featured a drum for P in my baby gift guide. Something I know Noah would want too, so when I received this snazzy piece for Noah I was in love myself (No of course I haven't played with it *ahem) It's incredibly interactive with all different sounds, a tremendous amount of buttons that all trigger lights and noises. It's just so ideal to keep those crazy toddler hands busy. Dolls house - Boy or not, my son is having a dolls house. He is really into intricate little toys now, and I just know by the fact he always begs for the one in Asda, that he will love putting all the furniture in, moving it around, sending the children to bed. It's completely perfect for him and even lights up - bonus! Flash Cards - Although these specify for baby, Noah has loved these, we framed a couple in the boys rooms and not only have they really helped Noah learn some new animal names he didn't know, they're really cute to look at. Craft Tub - I hate seeing crafty tutorials and then realising we don't have half of the things we need, I figured a couple of different craft sets are the way to go, as you get a bit of everything. Noah actually spied this under the bed and I had to use some major negotiating and fibbing skills to get him to come away from it. I just know he'll love getting crafty together using this. Bath toys - This is GENIUS, in fact I've never seen a bath toy like this. A mimic of Daddy, Noah can pretend to have a shave with this super cool set. Even when I showed John, he let out a little 'Aw, that would have been perfect for me when I was little'. After all, who doesn't love a bubble beard? Matching pogs - We love matching games, if you notice I featured some snap cards in our stocking fillers guide. Though from past experience they often get ripped and look worse for wear after a few months, I think these wooden ones will combat that perfectly, he's not going to be able to cheat as he knows 'the zebra cards have a rip in them' or any of that business. A really nice family game. First reader books - I fell in love with these books from Marks & Spencers early this year, when we purchase a new one, it always without fail becomes Noahs favourite book. They have the story for you to read, with sweet illustrations, then as your little one begins to learn to read, they include a couple of summary words for them to join in with on each page. Amazing. Make sure you check out my other gift guides this year. Ooh I want to get Buckaroo for my kids, I think they'd love it - brilliant you're getting your boy a dollhouse! 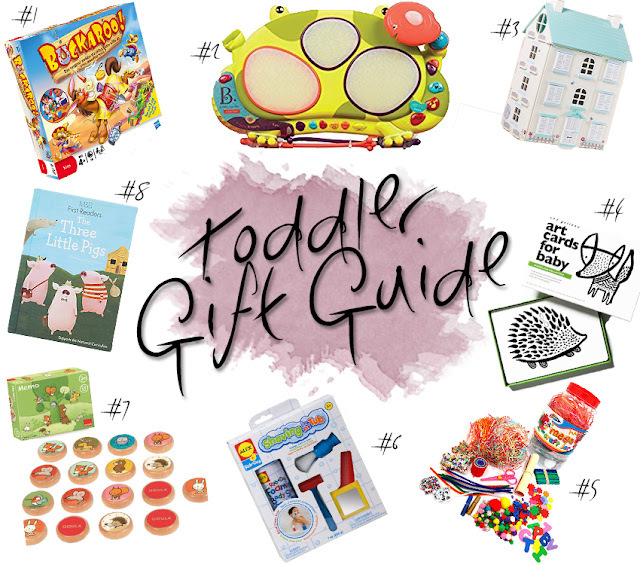 Gift guides are so fun to pull together! I particularly like the baby art cards, they are really different!